The UFO Detector is now available in kit form. 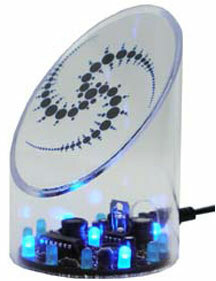 The UFO Detector kit contains 13 LED lights that light in a circular sequence while the unit is in detection mode. When an anomaly is detected, all lights flash and the unit makes a beeping sound. The UFO Detector kit is available in red and blue. Kit includes circuit board, all components for construction, and 6-9V AC wall transformer. Finished circuit board is approximately 3" in Diameter by 4" tall. UFO Detector Video - The current version UFO Detector works the same way. Resetting is a bit different. The transparent case and the electronics are separate. So one lifts off the transparent case first then turns the electronics upside down to reset.